WASHINGTON (AP) — Trump administration officials pushed back Wednesday against a Democratic senator’s claim that nearly $10 million from the government’s disaster relief agency was transferred to immigration enforcement. The Oregon senator said the administration took $9.8 million from the Federal Emergency Management Agency’s “response and recovery” and put it in the coffers of U.S. Immigration and Customs Enforcement. He based his claim on a 39-page Department of Homeland Security transfer and reprogramming report dated Aug. 31. The report shows that funds came from FEMA’s “operations and support” budget and went to fund ICE functions including detention beds and transportation and removals. DHS officials said the account supports FEMA headquarters operational expenses and cannot be used for disaster response. It came in under budget for expenses including travel, training and office supplies and money was moved. The claim sparked an emphatic denial from Homeland Security Department, which said the impact on FEMA’s response and recovery efforts was zero. The agency’s budget is more than $15 billion. Homeland Security has the authority to move money around between its components, which include immigration agencies, disaster management, the U.S. Coast Guard and the U.S. Secret Service. Other agencies had money moved around. According to Sen. Patrick Leahy’s office, Homeland Security notified Congress on June 30 that it would transfer $200 million from other agencies to ICE, including the funds from FEMA. Leahy, a Democrat who is the Senate Appropriations Committee vice chairman, said the transfer was approved by the subcommittee chairs and no Democrats signed off on it. Merkley’s office said he found the reallocation concerning given last season’s hurricane response, when the agency was criticized for its handling of Hurricane Maria. Merkley spoke about the document Tuesday on MSNBC’s “The Rachel Maddow Show” and on CNN Wednesday. Merkley has been a leading critic of the Trump administration’s immigration policies, including the “zero tolerance” policy at the border that resulted in nearly 3,000 children separated from their families. “This is yet another example of the Trump Administration’s outrageously misplaced homeland security priorities,” said Democratic Rep. Bennie Thompson of Mississippi, ranking member of the Committee on Homeland Security. Merkley’s office blasted the comment. 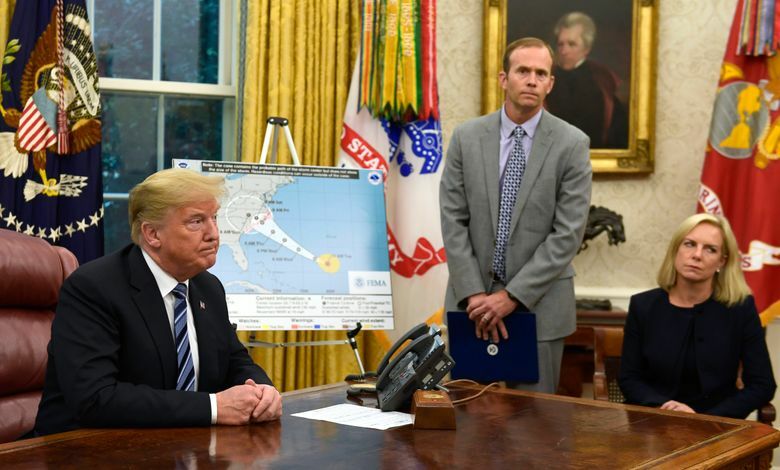 “It’s not surprising to see a defensive and completely fallacious response from the Trump administration to their irresponsible and dangerous decision to move money from FEMA,” said Martina McLennan, a spokeswoman. At a news conference at FEMA’s Washington headquarters about the impending hurricane, officials said the agency was properly funded and prepared, and it was most important to focus on the upcoming storm, which could do catastrophic damage.